Though it may not always be evident given Montreal's obsession with poutine and smoked meat, this city has a serious soft spot for healthy food. When you’re stuck working all day in a cubicle in the middle of a Downtown rush, getting what little chlorophyll you can from a green salad can spell the difference between life and death by ennui. To help you avoid the extra calories, and get in a dose of vitamins without strolling too far, here are the best healthy lunch spots in Downtown Montreal. 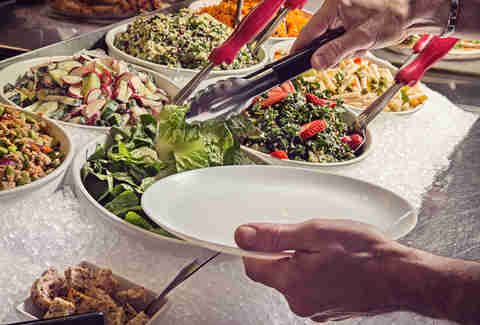 Mandy’s Salad Bar on Crescent is undoubtedly one of the best places Downtown to get a healthy, filling, non-vegetarian meal. Not as busy (or as cramped) as its Westmount counterpart, the Crescent location boasts the same cheerful design and extensive menu of salads and soups. 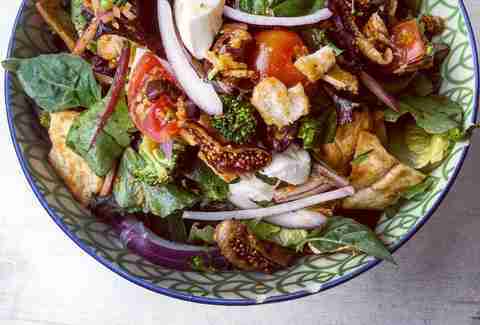 Go for the sublime Man’s Salad, or try the ultimate test of willpower by making your own. Though not everything at this vegetarian by-the-weight bar is healthy (there's usually a good amount of pizza), you can fill your plate with as many sprouts, vegan curries, and light quiches as your heart desires. Even if you overdo it, lunch caps at $16.50. This 1950s-style restaurant is a bit swankier than the title of 'diner' would imply. Come here when you want to impress your lunch pal, or sneak in a bit of midday boozing. 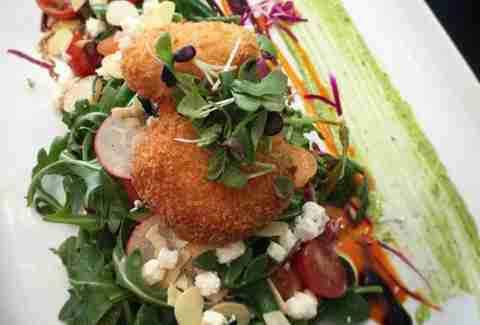 Definitely try one of the incredible salads on the menu. 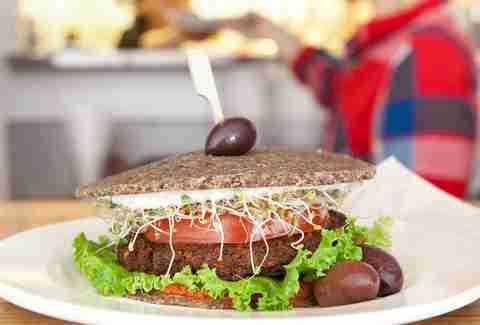 It doesn’t get much healthier than this vegan, raw, mostly gluten-free restaurant -- and that may be enough to scare off some fair-weather dabblers in healthy eating. Yet the food here is delicious, inventive, satisfying, and absolutely stunning in its presentation, and will convince even the most die-hard carnivore to stave off bacon for one lunch. Next door to Crudessence is another healthy eatery and Montreal institution, La Panthère Verte (The Green Panther). An ode to simple Middle Eastern food, it serves falafel, salad combos, and a rotating variety of daily specials, from curry to chili. Though no one is reinventing the wheel here, the food is affordable, comforting, and consistently good. With a beautiful patio, distressed walls, and the chic atmosphere of a hip Brooklyn hangout, Café Parvis is a piece of hipster paradise in the midst of suit-clad Montreal. With unique pizza combinations and a wide selection of salads in three sizes, it’s a great place to forget the world for an hour, or spend time with someone you truly fancy. A long, sleek counter dominates this little room, with some of the city’s hippest businessmen leaning over it to eat during every lunch hour. The fast-food atmosphere and cafeteria-style ordering belies the quality of the food, though it likely helps keep Anton & James one of Downtown Montreal’s best-kept secrets. 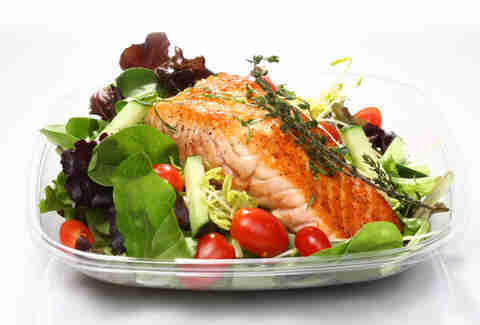 The less health-conscious can try one of the many excellent pizzas, but we would urge you to order the cedar plank salmon salad. 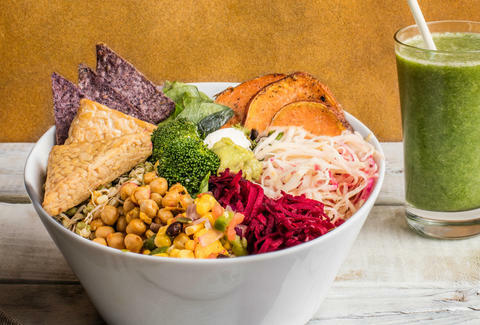 This vegan chain is the perfect place to grab a healthy lunch that's a bit different than the rest. 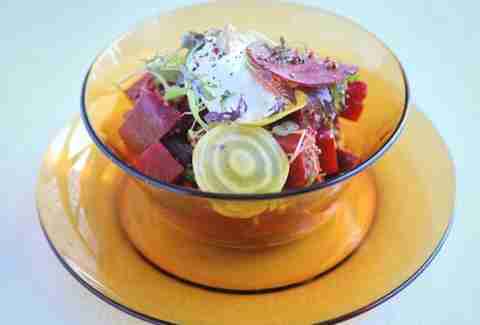 There are great vegetarian burgers here, but we're partial to the bowls. With your choice of grain or salad base and a slew of flavour combinations, your lunch will go a long way without putting a massive dent in your wallet, or taking up too much time. Though Miss Prêt à Manger is predominantly a catering business, it’s impossible to walk past this little restaurant’s colourful lunchtime selection. Everything here is fresh and organic. In case it isn’t clear yet, Montreal has a serious love affair with vegan food, and Lola Rosa is the temple at which we worship. The eclectic menu, excellent desserts, and warm, rustic décor at the Milton Street location have many fans storming its doors at all hours. Lunchtime is especially busy here. 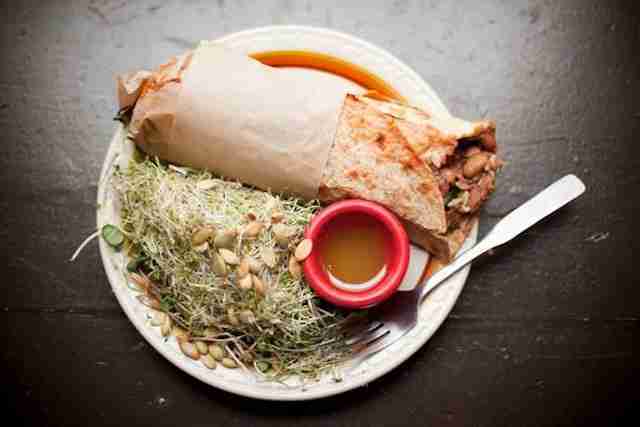 For a side of politics with your vegan lunch, look no further than Burritoville. This little Concordia University hangout and eatery is a co-op that doubles as a nighttime performance venue. You can count on the food to always be fresh, ethically-sourced, cruelty-free, and anti-capitalist. Ksenia Prints is a freelance writer and food blogger, photographer, and recipe developer at www.immigrantstable.com who is always on the lookout for the next healthy eat in Montreal. Follow her exploits in the kitchen and beyond @immigrantstable.